^ Debian – License information. Software in the Public Interest, Inc. [10 December 2009]. ^ 2.0 2.1 Licenses – Free Software Foundation. Free Software Foundation. [10 December 2009]. （原始内容存档于2008年12月16日）. ^ Licenses by Name. Open Source Initiative. [10 December 2009]. ^ Copyleft: Pragmatic Idealism – Free Software Foundation. Free Software Foundation. [10 December 2009]. ^ If a library is released under the GPL (not the LGPL). Free Software Foundation. ^ Make Your Open Source Software GPL-Compatible. Or Else..
^ Estimating Linux's Size. www.dwheeler.com. ^ 10.0 10.1 10.2 GPLv3 hits 50 percent adoption. ^ Why the GPL rocketed Linux to success. So while the BSDs have lost energy every time a company gets involved, the GPL'ed programs gain every time a company gets involved. ^ 14.0 14.1 Torvalds, Linus. COPYING. kernel.org. [13 August 2013]. Also note that the only valid version of the GPL as far as the kernel is concerned is _this_ particular version of the license (ie v2, not v2.2 or v3.x or whatever), unless explicitly otherwise stated. ^ GNU Emacs Copying Permission Notice (1985). [2015-11-08]. ^ The History of the GPL. [24 November 2011]. ^ 20.0 20.1 Stallman, Richard. Presentation at the second international GPLv3 conference, held in Porto Alegre. 21 April 2006. ^ Why Upgrade to GPL Version 3 --GPLv3. Fsf.org. [17 March 2011]. ^ FSF releases the GNU General Public License, version 3 – Free Software Foundation – working together for free software. Fsf.org. [15 January 2011]. ^ Creative Commons—GNU General Public License. [2010-07-20]. ^ 26.0 26.1 Stallman, Richard. Presentation in Brussels, Belgium—the first day of that year's FOSDEM conference.. 25 February 2006. ^ 27.0 27.1 GPL第三版 GNU General Public License. [15 June 2012]. ^ A Quick Guide to GPLv3 – GNU Project – Free Software Foundation (FSF). Free Software Foundation. ^ GPLv3: Drafting version 3 of the GNU General Public License. Free Software Foundation Europe. ^ gplv3.fsf.org comments for discussion draft 4. ^ Guide to the third draft of GPLv3. ^ Final Discussion Draft. [4 June 2007]. ^ GPL version 3 FAQ. [4 June 2007]. ^ Fourth Discussion Draft Rationale (PDF). [4 June 2007]. ^ Tiemann, Michael. GNU Affero GPL version 3 and the "ASP loophole". OSI. 7 June 2007 [19 August 2013]. ^ List of free-software licences on the FSF website: “We recommend that developers consider using the GNU AGPL for any software which will commonly be run over a network”. ^ 43.0 43.1 James E.J. Bottomley; Mauro Carvalho Chehab; Thomas Gleixner; Christoph Hellwig; Dave Jones; Greg Kroah-Hartman; Tony Luck; Andrew Morton; Trond Myklebust; David Woodhouse. Kernel developers' position on GPLv3 - The Dangers and Problems with GPLv3. LWN.net. 15 September 2006 [2015-03-11]. The current version (Discussion Draft 2) of GPLv3 on first reading fails the necessity test of section 1 on the grounds that there's no substantial and identified problem with GPLv2 that it is trying to solve. However, a deeper reading reveals several other problems with the current FSF draft: 5.1 DRM Clauses ... 5.2 Additional Restrictions Clause ... 5.3 Patents Provisions ... since the FSF is proposing to shift all of its projects to GPLv3 and apply pressure to every other GPL licensed project to move, we foresee the release of GPLv3 portends the Balkanisation of the entire Open Source Universe upon which we rely. ^ Petreley, Nicholas. A fight against evil or a fight for attention?. linuxjournal.com. 27 September 2006 [2015-03-11]. Second, the war between Linus Torvalds and other Kernel developers and the Free Software Foundation over GPLv3 is continuing, with Torvalds saying he's fed up with the FSF. ^ Kerner, Sean Michael. Torvalds Still Keen On GPLv2. internetnews.com. 2008-01-08 [2015-02-12]. "In some ways, Linux was the project that really made the split clear between what the FSF is pushing which is very different from what open source and Linux has always been about, which is more of a technical superiority instead of a -- this religious belief in freedom," Torvalds told Zemlin. So, the GPL Version 3 reflects the FSF's goals and the GPL Version 2 pretty closely matches what I think a license should do and so right now, Version 2 is where the kernel is." ^ GPL 3 Overview. Tech LawForum. 29 June 2007 [2 September 2013]. ^ 52.0 52.1 Selling Free Software. Free Software Foundation. ^ Reasoning behind the "preferred form" language in the GPL. LWN.net. 7 March 2011. 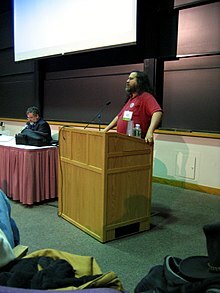 ^ Essay by Stallman explaining why a license is more suitable than a contract. ^ Eben Moglen explaining why the GPL is a license and why it matters. ^ Guadamuz-Gonzalez, Andres. Viral contracts or unenforceable documents? Contractual validity of copyleft licenses. European Intellectual Property Review. 2004, 26 (8): 331–339. SSRN 569101. ^ Allison Randal. GPLv3, Clarity and Simplicity. 14 May 2007. （原始内容存档于15 October 2008）. ^ GPL FAQ: Can I modify the GPL and make a modified license?. ^ Why They’re Wrong: WordPress Plugins Shouldn’t Have to be GPL. Webmaster-source.com. 29 January 2009 [15 January 2011]. ^ Licensing FAQ. Drupal.org. [15 January 2011]. ^ Frequently Asked Questions about the GNU Licenses – GNU Project – Free Software Foundation (FSF). Gnu.org. [15 January 2011]. ^ GNU GPL在法國勝訴. 2009-09-25 [2009-09-25] （中文（中国大陆）‎）. ^ ENTRY GRANTING REASSERTED MOTION TO DISMISS (PDF).